Last year was a tough one for Minnesota Vikings defensive end Everson Griffen. Not only did Griffen not have his best year on the field, he also had to deal with some trying mental health issues off it. Griffen’s wife said her husband “awoke in the middle of the night on Sept. 16 and left the home” and that Griffen does that “at times when he is fighting ‘demons’ in his head.” Griffen came back home on Wednesday and then left until Saturday. 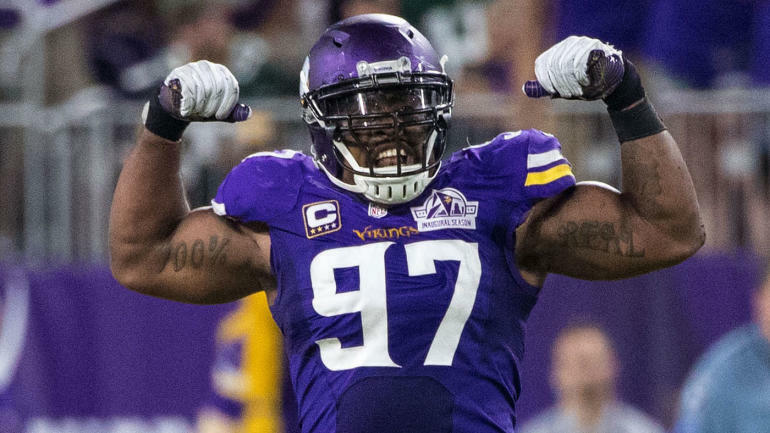 Police learned from Vikings player development director Les Pico that Griffen “has been really struggling for the past few weeks,” the police reports read. Pico said Griffen “has been explosive, screaming and yelling” at practice, the reports continued. Pico called Griffen paranoid and prone to repeating himself. Griffen’s wife then called and said he was at teammate Trae Waynes‘ home down the road. Griffen was trying to break in, had jumped through bushes and was shirtless. Within minutes, Griffen’s wife notified police that he was in a pickup truck with someone who didn’t know what to do with him. The man had encountered Griffen at a gas station, and delivered him home. Griffen was not arrested or accused of a crime, but was said to be “increasingly paranoid and feared someone was trying to kill him in the weeks and days” ahead of the incident. Griffen later returned to the team, and months later, he says he is feeling much better about both himself and his life. That’s not to say the experience was easy for him to handle. Griffen noted that having that balance and being happy will also help him on the field. Griffen, when at his best, is one of the premier edge rushers in the NFL. It’s obviously far more important that he be mentally healthy than that he perform in the field, but if the Vikings can have both of those things at once, they’ll surely take it. Here’s to hoping Griffen stays balanced, and gets back to his usual disruptive ways.